Although I have worked with scores of people over the years, I always look back most fondly at one editorial team in particular. Comprised of mostly women – all smart, witty and sharp as tacks – the team made me look forward to each work week and obliterated the “Monday Blues”. We were all just starting off at the company, learning together and bonding over shared triumphs and difficulties. The learning curve was steep – there were unfamiliar nuances of language, various dialects to deal with, stringent editorial regulations, new software programs and a whole body of knowledge to master in a very short time. As is usually the case with any group of learners, there were those who were quick and others who took a while longer to learn. The discrepancy between the fast learners and the slower ones did not matter. We were all in this together, as one team, and it was important that we all reached a certain level of proficiency as a team. Together we battled the various training tasks assigned to us each day – consulting each other when in doubt and lending a helping hand to anyone who was struggling or stuck. However, while we knew we could bank on one another to help out, there was this unspoken line we did not cross. We didn’t trouble each other over trivial difficulties – for instance, the meaning of a difficult word or the correct usage of a comma. We’d simply refer to our formidable list of knowledge resources – dictionaries, thesauruses, encyclopedias, editorial style guides, cheat sheets, our training notes and so forth. Why waste someone else’s time for something that one could easily solve on one’s own? That courtesy was, unfortunately, lost on one particular colleague. She couldn’t be bothered with the reference material, finding it easier instead to simply shout out her question, knowing that someone would answer. Over the days, our tolerance levels rapidly fell. It was distracting, not to mention downright annoying, to have someone shouting out frequently and tedious to have to look things up on her behalf. The group decided on some “tough love” and a plan was hatched. The next day, we were all prepared. As expected, she shouted out a question. “Hey! What’s XYZ?” she hollered and looked around expectantly. Her neighbour quickly held up a placard that read “Microsoft Bookshelf” in big, bold letters and continued working. Bemused, the lady piped down and went back to work. A few minutes later, she yelled out another question. Another hand. Another placard. This continued a few more times. Placards ranged from “Wikipedia” or “Style sheet” to a more blatant “Google it”. The lady was growing quieter. “You guys are so mean, yaar!” she finally grumbled. The final placard went up: “EVEN GOD HELPS THOSE WHO HELP THEMSELVES.” Message delivered successfully. Our days were peaceful after that. 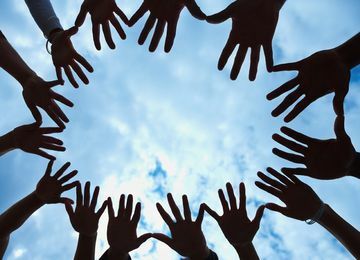 There are numerous helping hands around us in our professional and personal lives. And while it’s great to be able to reach out for help every once in a while, it is important to remember that ‘helping hands’ are not ‘crutches’. It is so tempting to be able to take the easy way out and exploit a helping hand. It is also equally important for those who reach out to help people to remember not to overdo it and baby them so much that they stop doing things for themselves. Anything learnt the hard way is never easily forgotten. Extend a hand to help someone get a leg up, but in the right measure. Everyone knows that adage about giving a man a fish versus teaching him to fish. It continues to hold true even in our times when we’re blessed with helping hands of all sorts around us: mentor programmes at work, women who have blazed trails in the corporate world before us, broken the glass ceiling and made our own paths just that much easier, seniors who are happy to guide and advise us, entrepreneurs who share their mantras for success and our very own SHEROES network with its dazzling lineup of mentors. Tap into this array of useful resources but don’t come to lean too heavily on them and disable yourself in the bargain.